I must have been home on a break from college at the time, but I distinctly remember it being a rainy Saturday afternoon when this book arrived in the mail. I thought the timing was perfect.What better way to spend a rainy afternoon than with a glass of chocolate milk, some chocolate chip cookies and a comic book (or two). The cover was perfect as well. To me this always struck me and one of the better covers of the Flash Silver Age run. The best ever would always be the “Who Killed the Flash?” cover, but this one was definitely top ten material. In fact, I’d put it up there with one of the finer renderings of the Silver Age period. It had all of the elements that a comic book cover should have. Lettering boxes slapped everywhere and a busy double action scene with another cover stuck in the corner. And go-go checks. Take me now Lord, I’ve seen it all! The book led off with Robert Kanigher’s version of the Flash’s Final Fling cover. Kanigher resorts to a trope he often used in his war stories where he would personify an object like a rifle or a bullet or something by having someone imagine that the object was talking to them. Here it’s the Flash’s uniform that appears to be talking to Barry as they both discuss the bond they share. Of course something needs to come along to break that up and that something is the Flash being late for his wedding. I don’t really care for an event of this magnitude being used to simply move a plot along. This is the kind of single story one-off thing you would see in say a Superman story where at the end everyone returns to “go” as if nothing had happened (much like your typical newspaper comic strip), but the Flash has already begun to present Barry’s life as moving along a more natural continuum where events are impactful, and the lives of the characters are fateful and destined. The Flash is late because on his way to the wedding he spots a super speed turtle (somewhat reminiscent of Kanigher’s inaugural Flash outing where he had the Flash chasing a villain named the Turtle) and gives chase. He then shows up late for his wedding because the turtle led him to a dimension that was on super daylight savings time. Iris calls off the wedding and Barry decides to call off his career as the Flash and hangs-up his uniform which, as it dangles from the tree has a tear rolling down its mask . In the end, when all is resolved and everyone returns to go, Barry and his uniform are reunited. Personally, I enjoyed the Gardner Fox version of this story in issue #159 much better. The better story in the issue is the tussle between the Flash and the Mirror Master. As stated in an earlier post, the Mirror Master was one of my favorite Flash foes and he certainly doesn’t disappoint here. This time around he’s developed a mirror that can see the future, and, naturally, he takes advantage of that fact to commit crimes. 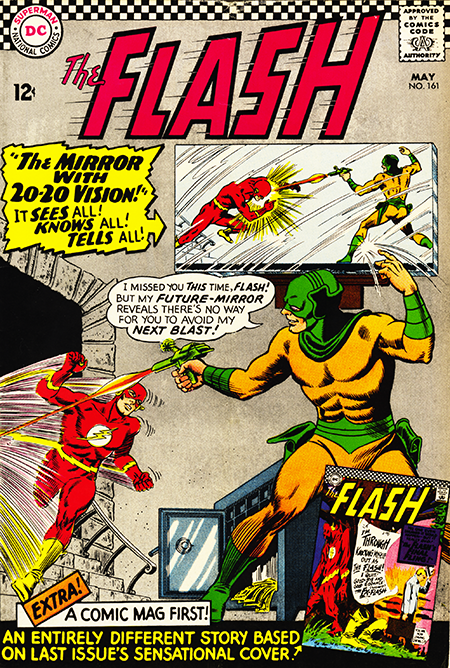 When the Flash arrives at his hideout, he sees himself shooting the Flash in the mirror and then seconds later in real time, but the the Flash he was shooting was a Flash that had traveled to the future and who, by stopping his, inner vibrations was able to return to his own time at the moment he was shot making it appear that he was obliterated. The Flash then waits three days for the future to repeat itself, goes to the Mirror Master’s hideout, watches himself get shot and disappear and then captures the Mirror Master. A nice little twist on the time-travel motif. On a future Flash Friday, we’ll travel back in time to the June 1966 issue of the Flash.